Talerang’s copyrighted curriculum was researched as a project Harvard Business School. Our training methodology integrates Harvard cases, proprietary assessments, interaction with guest speakers, industry exposure and personal mentoring for holistic professional development. Our programs offer exclusive opportunities to work with over 250 of the best companies in India including the Aditya Birla Group, Foxymoron, Teach For India, Mahindra Group, Avaana Capital, Z3 Capital and more. Our team is from McKinsey, Citigroup, KPMG, ZS Associates and our Panels include CEOs of top companies. 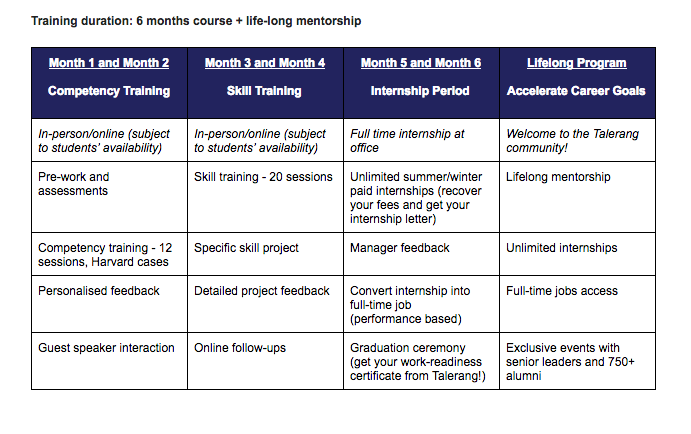 Students get dedicated mentors and interact with industry stalwarts from our Young Leaders Panel and Senior Panel. Our Future CEOs alumni also get to access a network that is a close knit community of close to 1000 Future CEOs who are advised by young industry leaders and a panel of industry stalwarts. Talerang’s programs are different from regular trainings and courses due to the international approach to learning and the international curriculum. During the research at Harvard Business School, we interacted with Year UP, a U.S. based organization solving a similar problem. We further refined our learnings by visiting 100+ colleges and partnering with 250+ corporates who defined our training curriculum. Our research shows that 6 key competencies - self-awareness, life vision, communication, working smart, first impressions and bridge to career help young talent succeed. Additionally, jobs of the future require a combination of 14 skills including research, analytics, digital marketing, finance, strategy, coding, communication and design. We ensure that you are learning in a planned and structured manner with a focus on being relevant for jobs of the future. 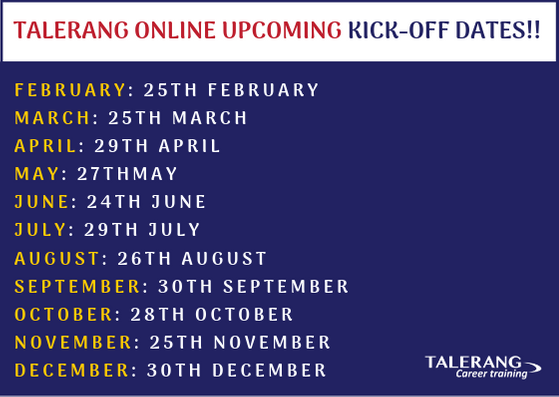 Talerang gets applications from close to 100+ premier colleges across India and has several rounds of selection. Our highly selective cohorts are academically bright, have demonstrated leadership and volunteered to impact their communities. Our previous students are articulate all-rounders including national level swimmers, debaters, festival organizers, entrepreneurs and performers. Over 4 years, we have placed 99% of our students and our proud that over 90% of them have been consistently rated as work-ready, with over 50% been given call-back offers for full-time jobs! The jobs and internships we provide are premium with a focus on quality. As special projects, we have been invited by research teams from Stanford and Harvard to conduct trainings on their behalf and also been the organization of choice for pre-placement training for IIT Bombay, IIT Roorkee and IIT Madras in an official capacity. 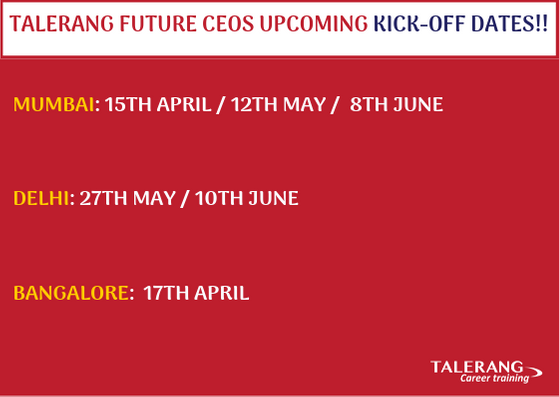 From Tata Trusts to Trilegal, various corporates have also invited us to on-board their entry-level hires.